This blog is dedicated to topics in the Data Warehousing Business Intelligence DWBI space. In particular this blog deals with optimal modeling techniques for business intelligence, data warehousing, big data and data integration. Presented here are the topics of Ensemble Modeling, Data Vault Modeling, Anchor Modeling, Focal Point (Fokal) Modeling, Hyper Agility, and many more. From information modeling to data modeling these are primarily related to the techniques and approaches we use when working with an enterprise data warehouse EDW. Also many of the topics deal with architecture and the broader data management program. The column to your right is visible on all pages and includes direct links to all blog posts [Hans Blog Posts] followed by a link to a download page for pdf format presentations and white papers [Presentations]. Following is a set of course outlines [Training Course Descriptions] and a set of links to online training videos lessons [Video Lessons]. Hans Patrik Hultgren is a Data Warehousing and Business Intelligence educator, author, trainer, and advisor. Hans is currently working on Business Intelligence and Enterprise Data Warehousing (EDW) with a focus on modeling and architecture including Ensemble and Data Vault modeling. Hans works internationally primarily in Nordics and EU (based in Stockholm), USA and Canada (based in Golden, CO) and down under in Sydney, Melbourne, Brisbane as well as Auckland and Wellington. Hans was with the University of Denver for 20 years and now continues an education focus with hybrid course delivery including e-Learning components. Courses delivered through Genesee Academy use blended and On-Demand DWBI training videos at http://www.DataVaultAcademy.com. Hans published the book Modeling the Agile Data Warehouse with Data Vault which is available on Amazon websites. Specialties: EDW, Data Modeling, DWBI Architecture, Ensemble Modeling, Data Vault Modeling, Speaking, Advising, Data Vault, Agile Data Warehousing, Education, Training, e-Learning, Entrepreneurship. Please it possible to get an ebook of “Modeling the Agile Data Warehouse with Data Vault”. Really enjoying your book, Hans. In your book chapter 17 you talk about a RAW layer and a BDW layer. The RAW layer exists only when the source system does not align with the central defined core business concepts. The question would then be: If the RAW layer does not align with the central defined view, do you create a Link in the BDW layer as well as creating them In the RAW layer? In your example for BAR (Part of BDW) you have Person and User created as RAW HUBS and Customer as BDW HUB and Link table that joins up the Person and User with the Customer, how would this work if it’s the Link table that is not in sync with the central natural business key relationships? Example: Link one Is not central view (RAW) (EconomicEpisodID as Driving Key. Link two Is not central view (RAW) (EconomicEpisodID as Driving Key. Link three Is aligned with the central view (BDW) (EconomicEpisodID as Driving Key. How do you connect the RAW links with the BDW link? Thanks Martin for your comment. There continues to be a great deal of conversation around the drivers for the design of links. If you consider that BDW Hubs (the identifiers for the Core Business Concepts) are designed from a business perspective and that RAW Hubs are created when concepts arriving from sources are not adequately aligned with the meaning of the BDW Hub – then it stands to reason that the Relationships (Links) can follow the same logic. Meaning that a BDW Link (Natural Business Relationship) is designed from a business perspective and RAW Links are created when relationships arriving from sources are not adequately aligned with the meaning of the BDW Link. 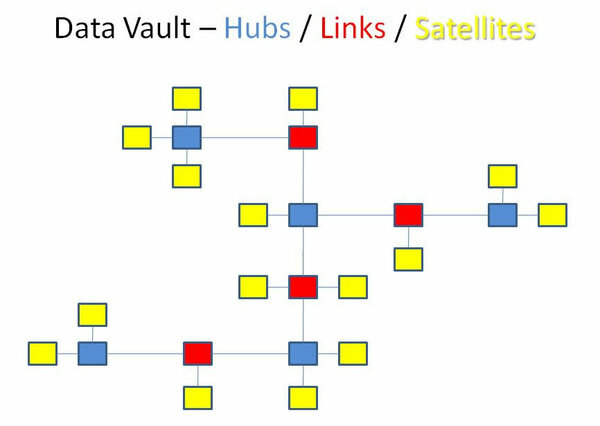 There can exist RAW Links, BDW Links and also Links that align a RAW Hub with a BDW Hub. The question is what will you need to capture all delivered data, align with a business view and keep your traceability? The answer will differ depending on the particular data warehouse program (goals and requirements) as well as the level to which the source systems are aligned with the central business view. I will continue looking in to if I will need to build/how to build a connection between the RAW liks and the BDW link. At the moment I’m trying to find out if all/some or none of the LINKS are aligned with the central view or not. If they all are then I would not need RAW links.